And here's how they'll do it. When it comes to cybersecurity, no nation can afford to slack off. If a nation’s defense systems cannot anticipate how an attacker will try to fool them, then an especially clever attack could expose military secrets or use disguised malware to cause major networks to crash. A nation’s defense systems must keep up with the constant threat of attack, but this is a difficult and never-ending process. It seems that the defense is always playing catch-up. In other words, what if defense systems could learn to anticipate how attackers will try to fool them? In order to address this question, Rubinstein studies how to prepare machine-learning systems to catch adversarial attacks. In the game of national cybersecurity, these adversaries are often individual hackers or governments who want to trick machine-learning systems for profit or political gain. Nations have become increasingly dependent on machine-learning systems to protect against such adversaries. Unaided by humans, machine-learning systems in anti-malware and facial recognition software have the ability to learn and improve their function as they encounter new data. As they learn, they become better at catching adversarial attacks. With adversarial machine learning, security agencies address this weakness by presenting the system with different types of malicious data to test the system’s filters. The system then digests this new information and learns how to identify and capture malware from clever attackers. Rubinstein’s project is called “Security Evaluation of Machine-Learning Systems”, and his ultimate goal is to develop a software tool that companies and government agencies can use to test their defenses. Any company or agency that uses machine-learning systems could run his software against their system. Rubinstein’s tool would attack and try to fool the system in order to expose the system’s vulnerabilities. In doing so, his tool anticipates how an attacker could slip by the system’s defenses. The software would evaluate existing machine-learning systems and find weak spots that adversaries might try to exploit – similar to how one might defend a castle. By analyzing many different machine-learning systems, his software program will pick up on trends and be able to advise security agencies to either use a different system or bolster the security of their existing system. In this sense, his program acts as a consultant for every machine-learning system. Consider a program that does facial recognition. This program would use machine learning to identify faces and catch adversaries that pretend to look like someone else. This is called a mimicry attack – when an adversary makes one instance (one face) look like another, and thereby fools a system. 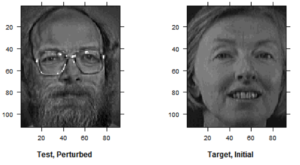 To make this example easier to visualize, Rubinstein’s group built a program that demonstrates how to change a face’s appearance to fool a machine-learning system into thinking that it is another face. In the image below, the two faces don’t look alike, but the left image has been modified so that the machine-learning system thinks it is the same as the image on the right. This example provides insight into how adversaries can fool machine-learning systems by exploiting quirks. When Rubinstein’s software fools a system with a mimicry attack, security personnel can then take that information and retrain their program to establish more effective security when the stakes are higher. “The attacker can come in from any angle. It only needs to succeed at one point, but the defender needs to succeed at all points,” says Rubinstein. In general, Rubinstein worries that the tools available to test machine-learning systems are theoretical in nature, and put too much responsibility on the security personnel to understand the complex math involved. A researcher might redo the mathematical analysis for every new learning system, but security personnel are unlikely to have the time or resources to keep up. With his software, Rubinstein intends to help level the playing field between attackers and defenders. By giving security agencies better tools to test and adapt their machine-learning systems, he hopes to improve the ability of security personnel to anticipate and guard against cyberattacks.